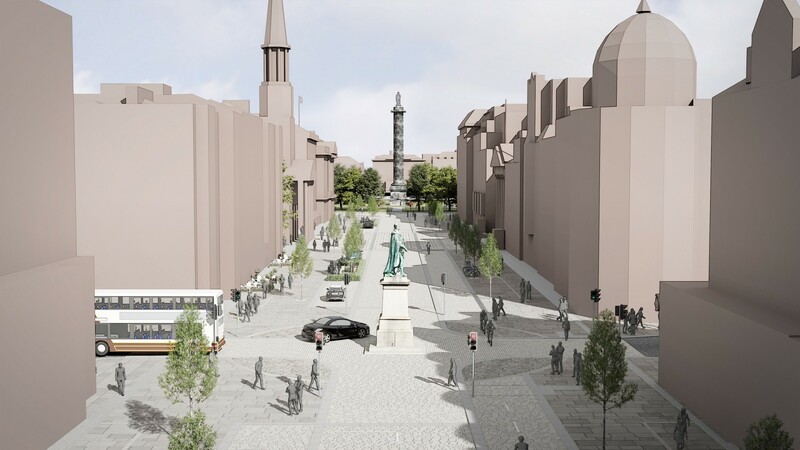 Edinburgh City Council and LDA Design have published draft concept design for a series of New Town public realm enhancements centred on George Street, including new squares, planting and cycleways. One element of the council’s City Centre Transformation project the plans seek to enhance the pedestrian environment by providing active travel options and improving accessibility. 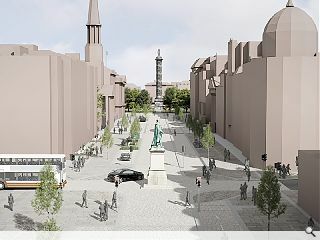 Planned interventions include more outdoor seating, widening pavements, the formation of new plazas and the creation of twin segregated cycleways. Removal of street clutter and central median parking is also proposed, alongside a ban on waste collection and deliveries outside designated hours. A drop-in session to discuss the plans are being held today at the City Art Centre until 19:00, with follow up events planned for Friday between 11:00 and 17:00 and Saturday from 10:00 till 14:00. I'm sure it would be great if it ever happened., but Edinburgh residents have become wearily used to the regular appearance and disappearance of 'design concepts' for the city centre. It's like Christmas, but without the fun. The New Town plan by Craig was a masterpiece of symmetry. Therefore the plan above needs to be in that spirit. An avenue of trees in the middle would work best, not the above ad hoc look in the above. There should be no trees. Apart from symmetry as noted above, there was a sharp contrast between the built form and breakout greenspace in the form of the squares, gardens and the borrowed views to topographical features. Get a grip CEC and EWHT. #3 I think we can be permitted to relent a little in the dogged adherence to James Craig's plan, given that one of its best qualities has been its adaptability and its flexibility within a strong formal concept to accommodate two-and-a-half centuries' worth of change and growth. The addition of street trees would hardly undermine its essential character but would add much in the way of relief and pleasure, gently softening some of the austere severity of the public realm. #4 Disagree...the stark contrast and rythme of built form and mature gardens is so important to the drama of setting. This looks a bit like an a retail car park. Piddly tree's and the whole 'plaza' chat needs to be removed from this otherwise worthy scheme. Why has this design been carried out and released before the results of the current city centre questionnaire / survey? Surely it would be better to wait for that and consider it in the wider context. For the image - unimpressed by the cycle junctions at the cross, why this silly change in paving delineation? Very confusing and not practical for either cyclists or pedestrians. Further, the trees / green landscaping is so underwhelming I almost fell of my seat. Was there a landscape architect used here? If not, why not? A pretty uninspiring image all round.